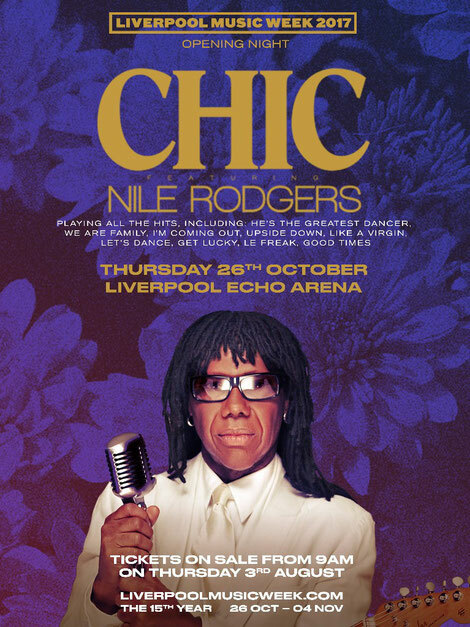 Liverpool Music Week recently announced that disco legends Chic Featuring Nile Rodgers will headline the 15th Anniversary Year Opening Night Party of the Liverpool-based music festival on 26th October 2017, in a performance at the Liverpool Echo Arena. LMW was recently crowned Best Metropolitan Festival at the UK Festival Awards 2016, and the opening night party will be their first show in the city in over four decades. Nile Rodgers amplifies his legacy as a multi-Grammy-winning composer, producer, arranger and guitarist by constantly traversing new musical terrain and successfully expanding the boundaries of popular music. Commenting on the news, Festival Director Mike Deane said: "It's been quite the journey since starting Liverpool Music Week as a single venue venture back in 2003, but there’s no doubt that today is our single proudest moment as we announce Chic & Nile Rodgers as our 2017 headliners. There aren't many individuals in music who compare to their legendary status, importance, and continued iconic relevance. We are utterly thrilled that both Nile and the band have agreed to join us this year. There really isn't a live music show quite like Chic, and we can't think of anyone better to open this milestone year." This year, LMW17 will run from Thursday 26 October – Saturday 4 November 2017 and will once again be utilising Liverpool’s ever-growing arsenal of venues, with the Invisible Wind Factory hosting two of the biggest shows this year, as well as some of its lesser-known spaces. 2016’s leg of LMW apparently drew over 12,000 music fans together for a celebration of Liverpool’s vibrant and ever-changing music scene, and in 2017 the festival continues to showcase a mix of touring artists and upcoming local talent, as well as the thriving musical community in the North West region.